The Dhammazedi Bell, believed to be the world’s largest, has rested stubbornly at the bottom of the Yangon River since 1599. Periodically it floats to the surface of the national consciousness as a source of pride, longing, superstition, fear and – inevitably, perhaps – conflict. We look back at this most fraught of national symbols by revisiting this article from The Irrawaddy magazine’s May 2014 issue. The language in an official method statement proposing the recovery of Myanmar’s famed Dhammazedi Bell owes everything to technology and science. But this is a story in which star billing goes not to science but to superstition, and a supporting cast of dreamers, schemers and assorted would-be heroes. Superstitious government leaders are just some of those who believe that the discovery of a bell said to have sunk to the bottom of the Yangon River off Monkey Point more than 400 years ago could be the key to the country’s rise from its current status as one of Asia’s poorest nations. Believers’ romantic desires to tie the Dhammazedi Bell with the national destiny has resulted in several failed missions over recent decades to reclaim the bell, believed to be one of the biggest in the world. Hollywood star Richard Gere’s purported interest in the bell was never more than a rumor. But over the years a motley crew of individuals and companies from the United States, Australia, Japan and Singapore has expressed interest in joining a search that for Myanmar Buddhists would be the equivalent of a quest for the Holy Grail. Non-believers, including former political dissidents, once thundered that any attempt to salvage the bell (reckoned to lie in the mud under 40 feet of water in a strong current), would only serve to legitimize an illegal military regime. Why such a frenzy? For answers, we need to look at the bell’s fabled history. 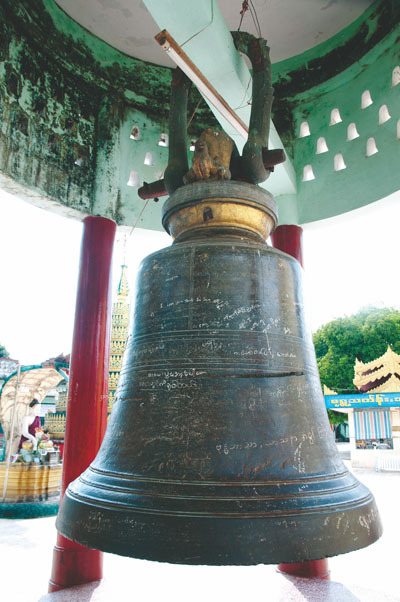 The bell was named after King Dhammazedi, who ruled the Mon-speaking Hanthawaddy Kingdom from 1471 to 1492. A devout Buddhist, Dhammazedi had the bell cast in 1490 as a donation to Shwedagon Pagoda, Myanmar’s most sacred shrine. Made from more than 290 tons of copper, gold, silver and tin alloy, it is said to have been more than twice as heavy as the Bell of Good Luck, a Chinese temple bell that at 116 metric tons has held the world record since it was cast in 2000. The bell remained at its intended home until 1608, when the ruler of Thanlyin, on the opposite shore of the Yangon River from Yangon (then called Dagon), decided he had a better use for all that metal. At the time, Thanlyin (or Syriam) was under the control of Filipe de Brito e Nicote, a Portuguese mercenary who in 1599 had led a Rakhine force that had sacked Thanlyin and Bago, then the capital of Lower Myanmar. De Brito (better known in Myanmar as Nga Zinga) had already earned the ire of local people by melting down several bells to forge cannons. But it was his decision to steal the Dhammazedi Bell for this purpose that ensured his infamy in this country for centuries to come. Using elephants and forced labor, he had the bell moved to the Yangon River, where it was placed on a raft for transport to Thanlyin. However, much to the satisfaction of onlookers, de Brito’s plan to turn a sacred object into weapons of war failed when the raft fell apart and deposited the bell far below the river’s surface. Five years after this episode, King Anaukpetlun of the Taungoo dynasty recaptured Thanlyin and had de Brito impaled on a stake—a punishment reserved for defilers of Buddhist temples. But 400 years after the Portuguese governor of Thanlyin met his ignominious end, the story of how he tried, and failed, to steal the Dhammazedi Bell continues to resonate in the imaginations of Myanmar citizens and foreigners alike. Since then, there have been many attempts to retrieve the bell, but poor visibility, silting, nearby shipwrecks and four centuries of shifting currents have so far made the task impossible. But everybody “knows” that it is still there—as late as the 19th century, some claimed that it was visible at low tide—and so the search continues. Some who have tried and failed, including tycoons and powerful generals, now say the quest is cursed. Jim Blunt, an American diver from California, was told as much when he made his own attempt in 1995 with the cooperation of the Myanmar authorities. “Several divers had already died looking for the great bell, including two Myanmar Navy divers who became trapped inside a wreck and died horribly. Consequently, the search [began] for outside expertise,” Mr. Blunt told the London-based newspaper The Independent. Mr. Blunt carried out 116 dives over a period of two years. In a documentary film about his experiences, he claimed that he banged his fist on the bell and was rewarded by a metallic sound. Historian U Chit San Win has made it his mission in life to relocate this lost artifact of Myanmar’s past. Since 1987, he has led a number of searches, including one in 1996 that was supported by then Military Intelligence chief Gen. Khin Nyunt. During one attempt in the 1990s, U Chit San Win lost a son to rabies. However, when asked what he thought about the curse that many believe is on the bell, he declined to give a direct answer. Others have been less reticent about their concerns. At a recent meeting between U Chit San Win and a government minister that was observed by a senior member of The Irrawaddy’s staff, the minister attentively listened to a detailed method statement and proposal to launch another search, but in the end declined to back the project because, he said, he feared for the safety of his family. Despite such misgivings, some remain determined to find the bell that they believe will save the nation. In October, U Khin Shwe, a leading Myanmar businessman and politician, announced a plan to fund another hunt for the bell, saying that he would spend more than US$10 million if necessary to return it to the glittering Shwedagon Pagoda. Some suspect U Khin Shwe’s agenda. As a powerful member of the ruling Union Solidarity and Development Party sitting in the Amyotha Hluttaw, or Upper House of Parliament, he is regarded as a controversial figure. Both he and his Zaykabar Company, a conglomerate with interests in the construction and telecommunications industries, have been on the US sanctions list since 2007, and more recently he was involved in a highly publicized land rights dispute with farmers on the northern fringes of Yangon. U Khin Shwe first came to the attention of policy makers in the West in the 1990s, when he paid the Washington, D.C.-based public relations firm Bain and Associates more than $20,000 a month to help burnish the image of Myanmar’s military junta. To return the favor, state media proudly proclaimed him to be a “doctor” with an honorary Ph.D. from “Washington University of the United States,” which turned out to be an unaccredited degree-mill incorporated in Hawaii but operating from a post office box in Bryn Mawr, Pennsylvania. Never one to miss a chance to improve his public image, U Khin Shwe (who is related to powerful Pyidaungsu Hluttaw, or Union Parliament, Speaker U Shwe Mann through his son’s marriage to the daughter of the former top general) has more recently joined other junta cronies in attempting to cozy up to opposition leader and Nobel laureate Daw Aung San Suu Kyi. Many suspect, then, that his high-profile plans to find the Dhammazedi Bell are little more than just another PR exercise designed to enhance his personal status. In any case, if he is serious about finding the bell, he has no shortage of people willing to offer words of encouragement. One well-known monk from Mon State has suggested that his mystical powers could ensure the success of the mission. But as a veteran of the quest, U Chit San has more practical advice: Go high-tech. “I don’t believe the bell can be recovered without the use of the latest technology, because according to my experience, using local technology won’t work,” he told The Irrawaddy last year. Nearly two years ago, it looked like U Chit San Win’s dream might finally come true. At a seminar held in Yangon in June 2012, a Singapore-based trading company, SD Mark International LLP Co., said it was willing to spend up to $10 million to finance a non-profit project to find the bell and convey it back to Shwedagon. The search was expected to take 18 months to complete. But since it was first announced, nothing has come of it. According to a source familiar with the project, it was quietly shut down by the Ministry of Culture, which had planned to participate, because of concerns about a lack of funding. U Chit San Win said he has no intention of giving up. “It has to be out there somewhere,” he said. Even as he said these words, however, he looked somber, as if he were reflecting on his past failures and on the loss of his son. Now in his late sixties, he seemed resigned to the possibility that he might not be around to witness the day the bell is restored to its former glory. One hurdle, he acknowledged, is that many in the country don’t want the bell to be found by foreigners. That’s why he supports U Khin Shwe’s mission, he said. The bell, he says, is a beacon of hope. “Our country is so poor and plagued with conflict. Many people believe that if the bell is found, it will bring us peace and prosperity,” he said. But will the spirits that many believe saved the Dhammazedi Bell from being turned into cannons now allow it to fall into the hands of shady businessmen? Many might argue that if that is to be its fate, perhaps it is better off where it is—submerged in mud, far from the grasp of mortal men and their schemes and dreams. Kyaw Hsu Mon contributed reporting. This article first appeared in The Irrawaddy’s May 2014 print edition.